How about housing a tourbillon inside a sports watch? 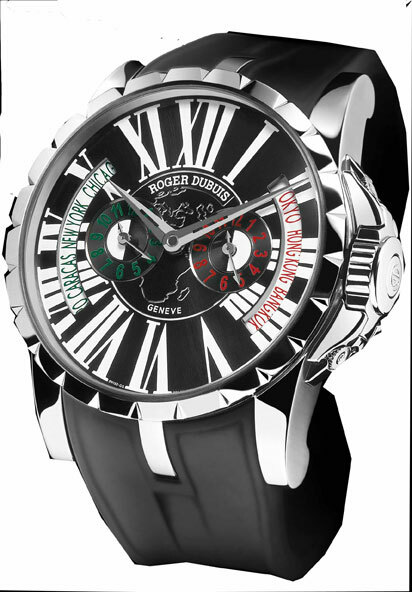 Roger Dubuis did it in 2004 and soon became a new benchmark. Pursuing this avant-garde path, Roger Dubuis combined noble metals with moulded rubber, which it used on the bezel and crown of its new EasyDiver collection. The EasyDiver model is distinguished by its fluted bezel with large Arabic numbers against a contrasting background and by its triple lugs, features immediately associated with the brand. The robust steel case with a 46mm diameter houses an automatic mechanical movement meeting standards to carry the Poinçon de Genève. The dial, with its black sunray background, is dominated by a large luminescent Arabic numeral at 12 o’clock, while the applied hourmarkers, which are also luminescent, frame the small seconds counter. The black flange has a white transfer minute-circle. The magnificent column-wheel chronograph movement highlights this brand-new steel case with its black and orange moulded rubber. The dial, with its silvered sunburst background, features applique numbers at 12 and letters at 6. For added depth, it opens onto two satin-finished zones above and below the black counters. The chronograph pushers feature orange and black moulded rubber elements to complement the bezel. The rubber strap is fitted with a steel folding buckle. This exclusive model which comes in a limited series of 280 is priced at Rs 15,90k. 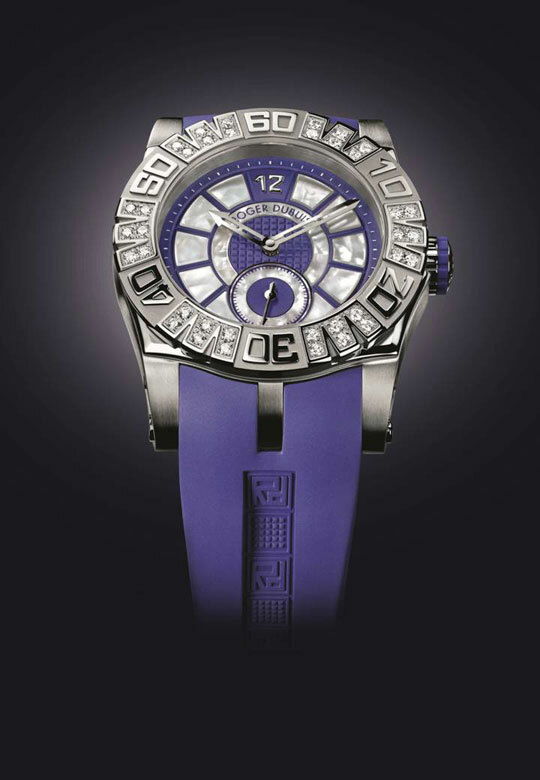 At the very centre of the dial’s purple background is a clou de Paris motif encircled by white mother-of-pearl. The small seconds rotates at the heart of a purple counter that is also encircled by white mother-of-pearl. A white minute circle is displayed on the flange. The steel case, set with 36 diamonds, houses a self-winding mechanical movement with a steel folding buckle and comes in a limited series of 888 is priced at Rs 7,70k. Roger Dubuis latest in Excalibur (45mm) collection innovates in terms of design through powerful signature features: its diameter, its wristband secured by the brand’s characteristic triple lugs, its refined crown guard and its fluted bezel mean this model simply cannot be compared with any other on the market. This mechanical self-winding movement, bearing the Poinçon de Genève quality hallmark, is distinguished by its triple time zone display. On either side of local time, two 12-hour counters with day/night indicators, arranged at 3 and 9 o’clock, each showing 12 meridians. The user only needs to select the city of his choice, by positioning it in the centre of the aperture by means of the respective correctors at 10 or 2 o’clock. The time is then instantly indicated by the larger of the counter hands, while the smaller one will move to the corresponding day or night indication. 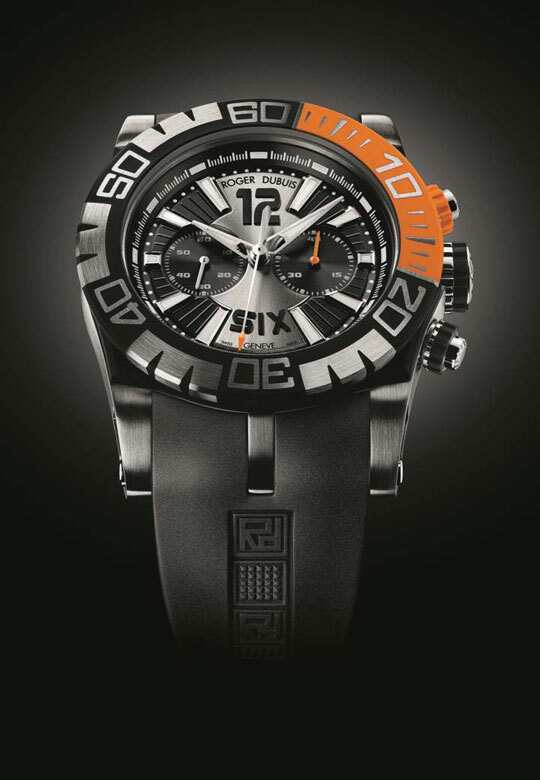 This steel model with black dial is available in other versions. Limited to 280 pieces. Price Rs 28,40,000. Available at Time Avenue Boutique in Mumbai and Kapoor Watch Company in New Delhi.